Radiant cooling in wine caves has two benefits according to Rob Main of The Engineering Partnership. The tangible benefit is the cooling of air mass that allows even, low temperatures that discourage oxidation in the wine making process. The other benefit has to do with, in a roundabout way, marketing. Rob Main explains, “When a wine tour comes into a wine cave and they have a big noisy cooling unit overhead it kind of ruins the ambience. With radiant cooling it’s all hidden in the floor and ceiling, it’s a real wine cave.” Caves are the rage in the winery industry for these two reasons, to keep the wine in a cool place and to keep the wine in, like, you know, a “cool place”. It’s really no joke. The very first thing that Tom Toedter, Construction Manager for Sonoma-Cutrer Vineyards, said when asked about their caves was, “When a tour group goes into the cave they don’t know what to expect, then they see the barrels and the tour lights come up, it’s really cool.” There’s that word again. So how cool can a wine cave get, in terms of temperature. ” We could set it up for a skating rink if we wanted to,” says Main. When Sonoma-Cutrer decided to explore the cave idea they asked Main if he could make the temperature a steady 50 degrees, he said yes. “Then they asked if I could make it 48 degrees, I said yes, then they asked for 46 degrees and that’s what they have.” The steady air temperature with no air movement, which a cooling unit and fan produces, literally stops any chance of oxidation in the wine barrels and allows Sonoma-Cutrer to barrel age their Chardonnay for 2 to 3 years when they choose to do so. Sonoma-Cutrer’s “cave” is actually an excavation down into a hill resulting in a subterranean environment with an 8 to 10 foot cover. “Radiant Cooling is actually a simple system once you understand the science behind it,” states Main, “you keep the air mass temperature constant without cold waves of air that cause temperature cycles, which in turn cause expansion and contraction that results in oxidation in the barrels.” It sounds fairly simple, but what about the 30 miles of glycol piping, 14 pumps and the control units that LeDuc & Dexter’s commercial department installed? All of the piping is now covered in the cement floor and ceiling slabs except the rather sophisticated control area in the west cellar, which doesn’t look so simple. LeDuc & Dexter’s Bill Zeeb started this design/build project with Rob Main and The Engineering Partnership in 1995. 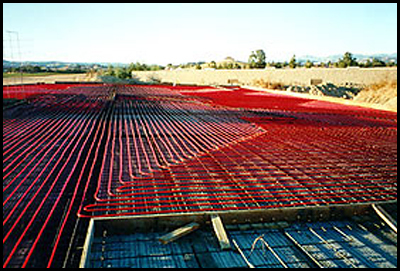 The radiant cooling system was completed in 1996 and LeDuc & Dexter have continued working with Sonoma-Cutrer on their overall expansion project through this year. LeDuc & Dexter have worked on radiant cooling systems with The Engineering Partnership at Stryker Sonoma , Nickel & Nickel Winery and have recently completed the first phase of cave construction at Ladera Winery in Napa.